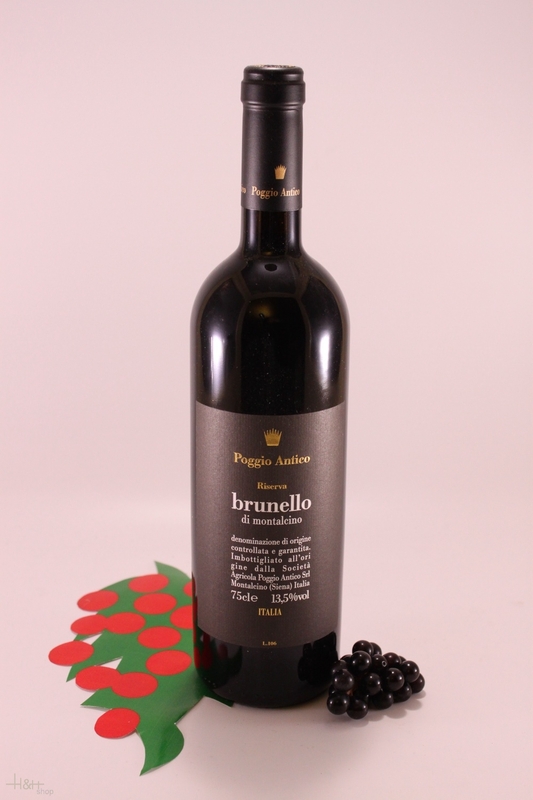 The Brunello Riserva Poggio Antico is only produced in exceptional vintages. In those years the grapes the oldest and lowest altitude vineyard are processed and aged separately. The Poggio Antico Riserva spends three and a half years in wood; the first year of aging takes place in 500-liter French tonneaux while the remaining aging is in new Slavonian oak barrels. The wine is then bottle aged for one and a half years before release to complete the mandatory five years of total aging. The result is a mature, round and complex wine. "Falstaff Magazin" has rated the wine "Poggio Antico Brunello di Montalcino Riserva DOCG, Tuscany, Italy" from the vintage 2010 on 18.03.2016 with 93 of 100 points. "Robert Parker The Wine Advocate" has rated the wine "Poggio Antico Brunello di Montalcino Riserva DOCG, Tuscany, Italy" from the vintage 2010 on 01.03.2016 with 95 of 100 points. "Wine Enthusiast" has rated the wine "Poggio Antico Brunello di Montalcino Riserva DOCG, Tuscany, Italy" from the vintage 2010 on 05.01.2016 with 92 of 100 points. "Vinous Antonio Galloni" has rated the wine "Poggio Antico Brunello di Montalcino Riserva DOCG, Tuscany, Italy" from the vintage 2007 on 01.09.2013 with 94 of 100 points. "Wine Spectator" has rated the wine "Poggio Antico Brunello di Montalcino Riserva DOCG, Tuscany, Italy" from the vintage 2007 on 15.06.2013 with 92 of 100 points. "Falstaff Magazin" has rated the wine "Poggio Antico Brunello di Montalcino Riserva DOCG, Tuscany, Italy" from the vintage 2007 on 22.03.2013 with 89 of 100 points. "Wine Enthusiast" has rated the wine "Poggio Antico Brunello di Montalcino Riserva DOCG, Tuscany, Italy" from the vintage 2007 on 05.01.2013 with 94 of 100 points. "Vinum Wine Magazine" has rated the wine "Poggio Antico Brunello di Montalcino Riserva DOCG, Tuscany, Italy" from the vintage 2006 on 01.05.2012 with 16 of 20 points. "Falstaff Magazin" has rated the wine "Poggio Antico Brunello di Montalcino Riserva DOCG, Tuscany, Italy" from the vintage 2006 on 22.03.2012 with 93 of 100 points. "Wine Enthusiast" has rated the wine "Poggio Antico Brunello di Montalcino Riserva DOCG, Tuscany, Italy" from the vintage 2006 on 05.01.2012 with 93 of 100 points. "Wine Spectator" has rated the wine "Poggio Antico Brunello di Montalcino Riserva DOCG, Tuscany, Italy" from the vintage 2004 on 15.06.2010 with 96 of 100 points. 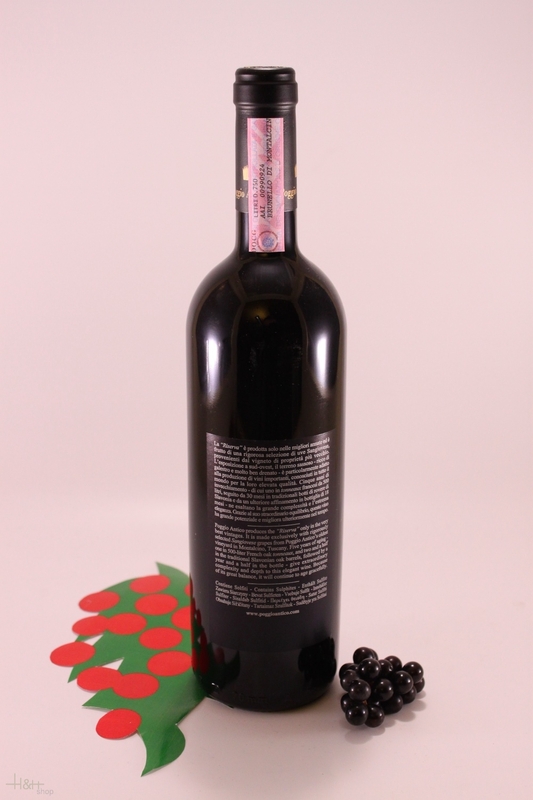 "Falstaff Magazin" has rated the wine "Poggio Antico Brunello di Montalcino Riserva DOCG, Tuscany, Italy" from the vintage 2004 on 12.03.2010 with 94 of 100 points. "Wine Enthusiast" has rated the wine "Poggio Antico Brunello di Montalcino Riserva DOCG, Tuscany, Italy" from the vintage 2004 on 10.01.2010 with 94 of 100 points. "Wine Spectator" has rated the wine "Poggio Antico Brunello di Montalcino Riserva DOCG, Tuscany, Italy" from the vintage 2003 on 30.06.2009 with 91 of 100 points. "Vinum Wine Magazine" has rated the wine "Poggio Antico Brunello di Montalcino Riserva DOCG, Tuscany, Italy" from the vintage 2003 on 01.04.2009 with 16 of 20 points. "Wine Enthusiast" has rated the wine "Poggio Antico Brunello di Montalcino Riserva DOCG, Tuscany, Italy" from the vintage 2001 on 11.01.2009 with 94 of 100 points. "Vinum Wine Magazine" has rated the wine "Poggio Antico Brunello di Montalcino Riserva DOCG, Tuscany, Italy" from the vintage 2001 on 01.09.2007 with 17 of 20 points. "Falstaff Magazin" has rated the wine "Poggio Antico Brunello di Montalcino Riserva DOCG, Tuscany, Italy" from the vintage 2000 on 04.05.2007 with 93 of 100 points. "Wine Spectator" has rated the wine "Poggio Antico Brunello di Montalcino Riserva DOCG, Tuscany, Italy" from the vintage 2001 on 30.04.2007 with 93 of 100 points. "Wine & Spirits Magazine" has rated the wine "Poggio Antico Brunello di Montalcino Riserva DOCG, Tuscany, Italy" from the vintage 2000 on 01.10.2006 with 93 of 100 points. Buy now this product together with Sarntaler Mountain Salami L. Moser - approx. 290 gr. ready for shipment: in ca. 5 days Sarntaler Mountain Salami L. Moser - approx. 290 gr. San Leonardo is the magical heir to a tradition known the world over as Bordeaux blending. Dreams and heritage mingle to bring you a wine that conveys all its land-rooted character and genuine territory-focused appeal. A powerful yet elegant red, San Leonardo brings together the colours, aromas and savours of Cabernet Sauvignon, Cabernet Franc and Merlot aged in small oak barrels, melding them harmoniously into a uniquely intense, full-bodied wine with superb depth of flavour. Matching dishes: salami, grilled meat, pasta, stews and bouillabaisse stewed fish. Venosta Valley Alpeggio matured cheese approx. 1 kg. Hard cheese bovine raw milk, Appearance: cylinder form - slightly concaved, Aroma: strong hay scent, Flavour: balanced, Consistency: rubbery - compact, Maturation: 6-12 months, bunker.